We have gotten so used to eating white rice with everything, and there are few things more satisfying than a creamy risotto. But the heaviness of that comfort food is not just expanding your waistline but also spiking your blood sugar. Try this wonderful whole grain instead, and benefit from the extra fibre, essential minerals and slow release of energy. ½ Cup of whole buckwheat, rinsed thoroughly. 1. Heat a tablespoon of olive oil in a medium sized saucepan and gently sauté the onion/shallots, celery and garlic until soft and lightly browned. 2. Add the buckwheat and stir for a minute to mix thoroughly. 3. Increase the heat a little then add the white wine or white wine vinegar so it sizzles and de-glazes the pan. 4. Add all of the stock to the pan and heat until simmering. 5. Lower the heat a little and cover the pan to cook the buckwheat and absorb the liquid – about 20 minutes. 6. When the buckwheat is cooked, take the pan off the heat. 7. Add the goats cheese and parsley and stir thoroughly so the cheese melts through the buckwheat. 8. Heat a little olive oil in a frying pan and add the kale strips. Stir fry lightly until the kale is wilted. 9. Transfer the kale to the buckwheat pan and stir thoroughly. 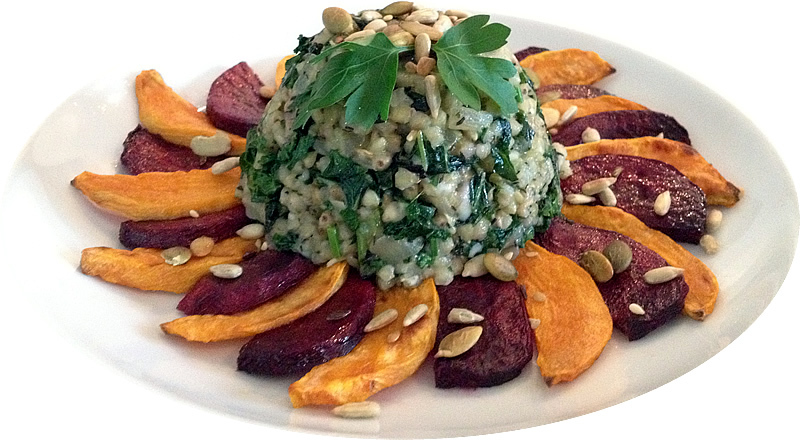 Tip: I love this ‘risotto’ served with roasted slices of sweet potato and beetroot. Simply coat the veg slices in olive oil in a bowl, then transfer to a foil-lined tray and bake in a moderate oven for approx. 20 minutes. Turn halfway through cooking time.